Honeywell and DuPont both make the new refrigerant, which meets the new European Union climate guidelines. BERLIN (Reuters) -- An air-conditioning refrigerant that has been criticized as potentially unsafe to car passengers is actually safe to use, according to preliminary results released by SAE International, an influential automotive engineering association. 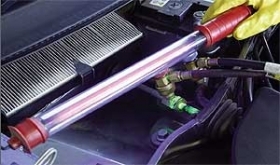 The coolant, known as HFO-1234yf, has been at the center of a heated dispute between Daimler AG and U.S. conglomerate Honeywell International Inc.
Honeywell and DuPont Co. both make the new refrigerant, which also happens to be the only product of its kind that meets the new European Union climate guidelines. Daimler had prompted the recent study after simulated crash tests in August found that a mixture of the refrigerant and air-conditioning compressor oil released under the hood of a car could ignite on the hot surface of an engine, releasing a deadly gas. The Daimler test sent the industry, and Brussels, scrambling to figure out whether years of tests that showed the new product to be perfectly safe could have been flawed. Honeywell and DuPont are deeply invested in the success of the new refrigerant, and have mounted a public defense. Honeywell issued a statement on Friday. Initial results of tests conducted by 13 major auto manufacturers and compiled and vetted by the SAE, formerly known as the Society of Automotive Engineers, were issued on Friday. Daimler was one of the 13 automakers involved in the testing. The SAE International said preliminary results show there is no reason to change its previous stance that HFO-1234yf is safe to use in automobiles. The SAE is expected to issue its completed risk assessment in mid-February and will publish the new findings by the end of the second quarter in 2013. "To date, the majority of the (automakers) involved in the new (research) do not believe that any of the new information reviewed will lead to a change in the overall risk assessment," the SAE International said. Outside of Daimler, the SAE said, no other automaker provided "information that would suggest a concern for the safe use" of the new refrigerant. The issue is controversial as the entire auto industry has been on its way to rolling out the new refrigerant in the European Union starting in January, as part of an EU directive banning refrigerants now used, which the EU says create high levels of greenhouse gas emissions. Were other carmakers to discover that the refrigerant mix is combustible at certain engine operating temperatures, then regulators as well as public opinion might force them to find a new, more expensive and technically complicated solution to meeting the EU directive. Daimler indicated that the new research does not alter its stance against the use of HFO-1234yf. "This preliminary opinion from a continuing investigation of SAE is based primarily on assumptions and does not reflect what our tests showed repeatedly," a spokesman for Daimler said, adding that Mercedes-Benz would still not use the substance.